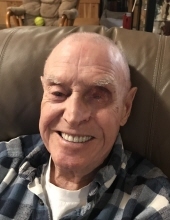 PITTSFIELD-George C. Moody passed peacefully at home surrounded by family on January 25, 2019, at the age of 90 years old. A funeral service will be held at 3 p.m., Friday, February 1, 2019, at the Shorey-Nichols Funeral Home, 191 Hartland Avenue, Pittsfield, with Rev. Glenn Nichols officiating. A gathering will follow at the funeral home and all are welcome. A spring committal will be held at the Village Cemetery, Peltoma Avenue, Pittsfield. To send flowers or a remembrance gift to the family of George C. Moody, please visit our Tribute Store. Guaranteed delivery before George's graveside begins. "Email Address" would like to share the life celebration of George C. Moody. Click on the "link" to go to share a favorite memory or leave a condolence message for the family.